Home > 2018 > 11/29 > I wonder who the “Player TBD” jersey giveaway is?! I wonder who the “Player TBD” jersey giveaway is?! The Blue Jays announced their 2019 promotional schedule on Thursday. It features some new stuff like Zombie Day in September and LOONIE HOT DOGS and some old stuff like jersey and bobblehead giveaways. LOONIE HOT DOGS GOOD LORD. Once a month for the entire season you can hit up the Dome and absolutely stuff your face with hot dogs for the reasonable price of $1. That’s a Costco Cafeteria quality good deal! Zombie Night on Friday the 13th. I’m already planning my witty online content for when we’ve been watching the team despite them being 10 games out of the division in April for months. It’ll be wild! A Marcus Stroman uhhhhh Gnome bobblehead giveaway on Mother’s Day! 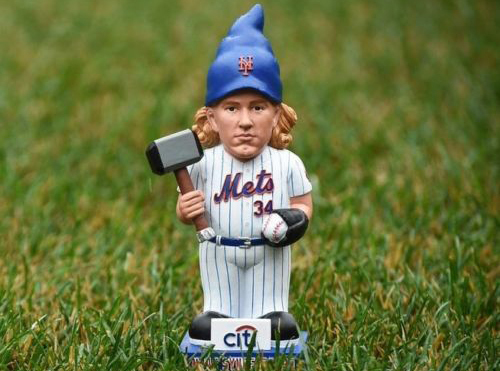 I imagine than when Stroman was beefing with the team post-arbitration last year that they figured the best way to get back at him would be a firm reminder of his height by turning him into a gnome. Lourdes Gurriel Jr. also gets himself a bobblehead in April! There’s a few jersey giveaways. There’s a throwback George Bell powder blue jersey giveaway, which maaaaaybe hints at the team considering a throwback style in the near future? Then there’s these two TBA jersey giveaways. Hmmmmmmm I wonder what that means. Of course, they can’t say they’re doing a Vlad jersey giveaway months before the season because he isn’t going to crack the roster and that would compound what is already going to be a PR nightmare. Still, one will obviously be Vlad, and the other will likely be whichever Justin Smoak/Kevin Pillar/Randal Grichuk player hasn’t been traded away at that point. Or, if a young guy like Danny Jansen really breaks out, they can pivot and give his jersey away. Who knows! Look at that promotional versatility! Final note, I’m kind of sad they moved away from some of the more creative giveaways they had last year like the Buck GET UP GET UP alarm clock. I mean, people probably care more about a bobblehead or jersey, but I appreciated the unique aspect of those weird things. The gnomes aren’t a booblehead, but a different, non-bobbling statuette. Will Stromans only be half that size?